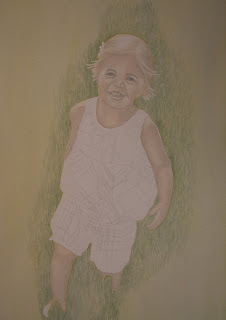 She is starting to take shape now and her skin tones have been warmed up. Next I will add a healthy pink glow to her skin and work on the details of her eyes and lips while lightening some of the pencil lines. The reference photo was taken at my client's farm on a warm sunny day so her skin has more of a warm glow from the sun. I love the way the light is reflecting off of her hair and side of her face giving such a nice glow you can almost feel the sun. Aaha as we sit waiting for snow here! You've been busy! This is a really good way to record-keep your process/progress. You'll be able to look back in a couple of years and be so glad you did it. Sorry to hear your back is still giving you grief, what a drag! Unfortunately all the chores don't go on hold too hey. I am just getting caught up after being sick for a week, makes you realize all you do in a day!